My giveaway is over and we have a winner.....drumroll (can you hear it??? 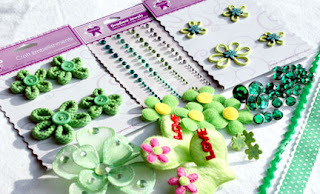 )...Nati from "Nati's Little Scrap Blog will be getting the goodies from Scrapbooking Supplies R Us. Congrats girlie! And if you have time visit Nati's inspirational blog! Life's been difficult this week. My Papaw, who I adore with all my heart, is VERY ill. He's been in and out of the hospital since February and took a turn for the worse last nite. But God had other plans and he's thankfully still with us. It's not easy seeing someone you love suffer. This is a picture my Aunt Tammie took (link to her blog is to your right). He's at my barn looking at the chickens and enjoying the day. Papaw grew up on a farm and came from a family of hard workers who appreciated the land. He loves that I adore farm life and is always asking about the animals. I think he can see a glimpse of his younger days thru me. I would appreciate you all keeping him in your Prayers. He's in ICU with pneumonia in both lungs plus congestive heart failure. Hi all! I've decided to start a new adventure and wanted to share it with you. OK, first up...who knows Shimelle? 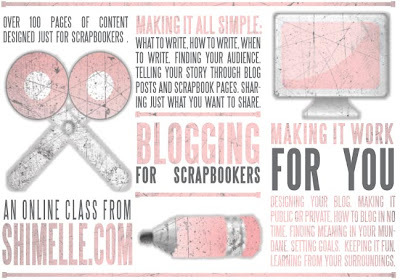 She's one of the most inspiring scrappers and bloggers around. 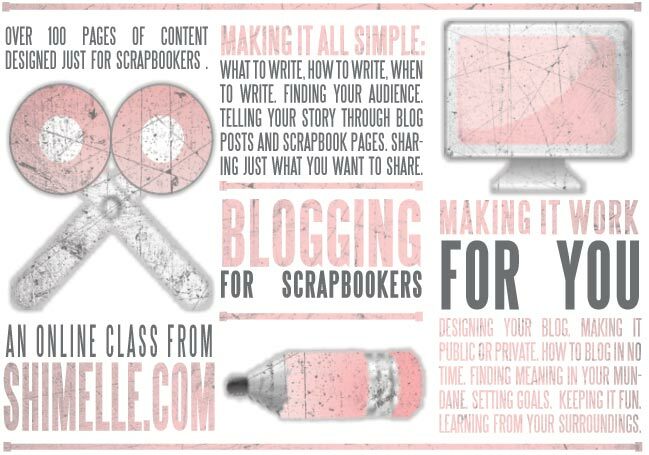 I decided to take her class: Blogging For Scrapbookers. For prompt 1 we are also encouraged to share a picture. 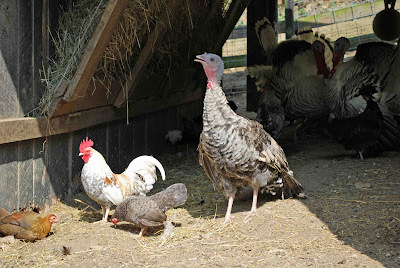 This is the "breeze way" at our smallest barn where the chickens and turkeys hang out on hot days. They love playing in the dirt and chasing bugs. 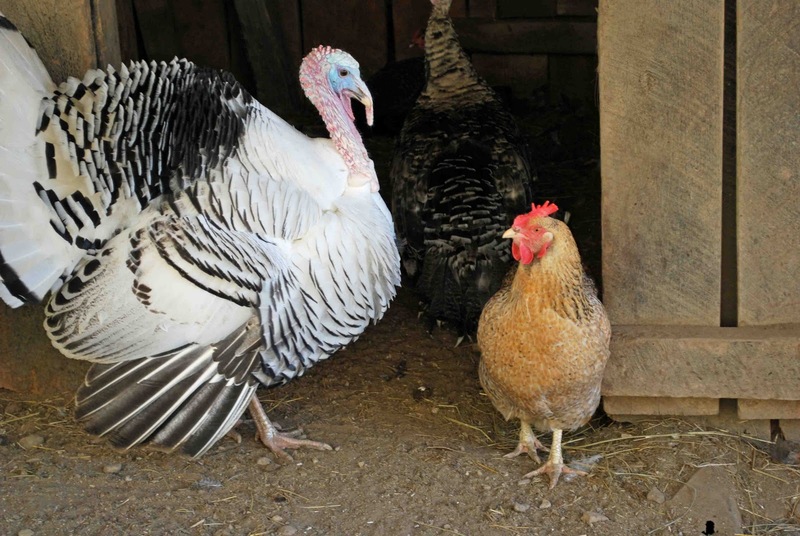 The large weird looking bird is "Shanana" our female turkey. We bought her at the stock sale a few months ago. Shanana came to us with a few disabilities and in poor condition. After high protein food and TLC, she's already laying eggs! We may have baby turkeys in our future! Shanana is definitely unique! That's all of my farm story for tonite. I felt bad not leaving you with a bit of craftiness, so here's a October Afternoon "mini" I'm working on. 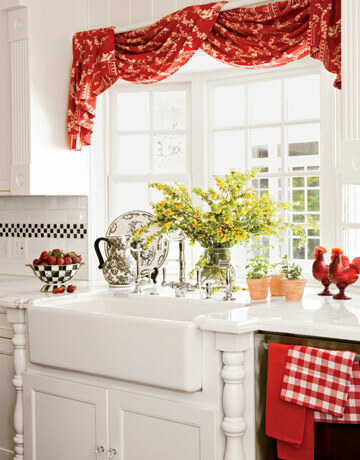 Like the curtains??? 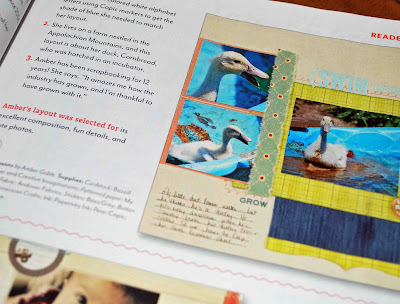 Visit Shimelle.com to check out Blogging For Scrapbookers! One of my favorite techniques is to simply go around the edges of my patterned paper with brown ink. This gives it a vintage feel. 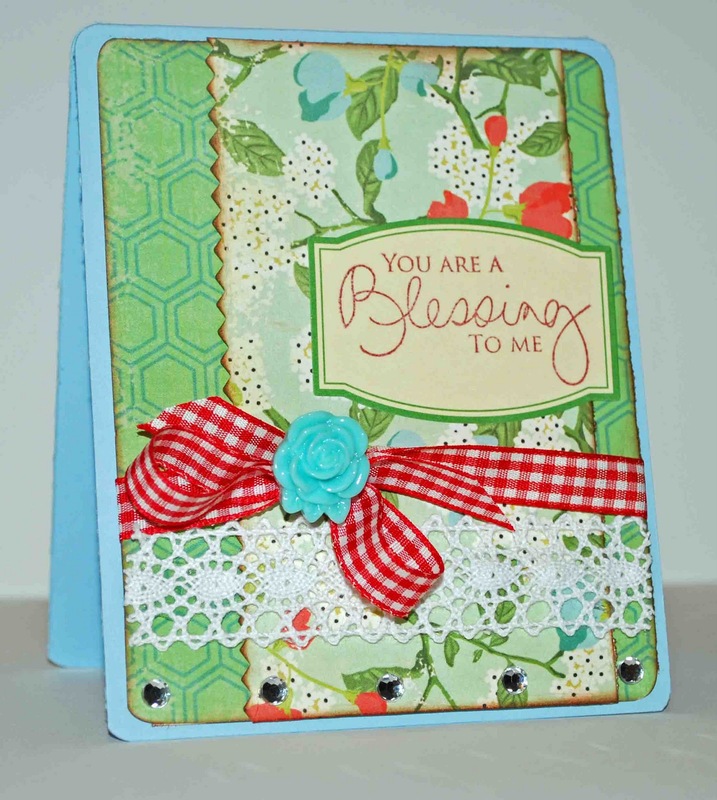 I used Echo Park patterned paper, Papertrey Ink Stamps, American Crafts Flower Brad, Really Reasonable Ribbon lace, My Mind's Eye Ribbon, and Creative Charms Jewels. 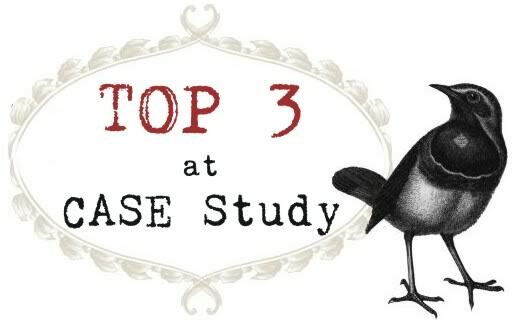 Visit If The Shoe Fits to see the Design Team's take on this week's challenge! Click for The Sampler Sketch Challenge and my GIVEAWAY!!! Hi guys! It's been a stormy evening in Kentucky. The storms haven't been half as bad in my area as they've been North of us. It was the perfect day to take Gracie (my Schnoodle) to the groomer and do some shopping. I've got a LO to share from the March Sampler Kit from Scrapbooking Supplies R Us. Here I am with our goat dog (Great Pyrenees) Brisco. I would appreciate it if no one would zoom in - no make up! I let the Sassafrass Las patterned paper do the work for me and added my picture and a few papers to the middle. 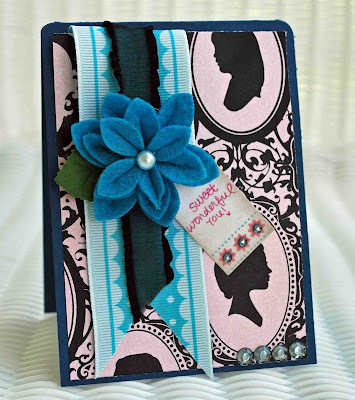 I didn't "over embellish" because the flowers on the Sassafras PP were plenty enough and I added the journaling to it also. This is a current picture of my Brisco. He's probably 40 lbs heavier (from October to March!). And I know that he's a goat dog, but Brisco do you have to get so dirty??? 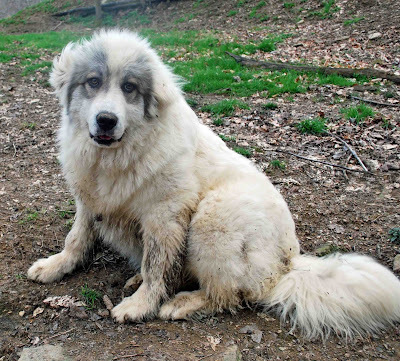 He loves nothing more than to roll around in goat doo doo and mud! Thanks Case Study! I couldn't be happier! I might as well grow old gracefully! Honoring my 31st birthday (or the second anniversary of my 29th birthday). This LO was made with goodies from the Sampler. Now who would like to win a prize from Scrapbooking Supplies R Us. 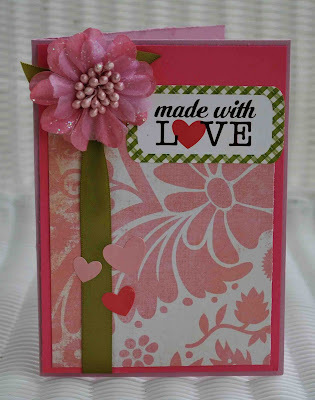 Just leave a comment on my blog and I'll pick a winner by Monday, March 28th. 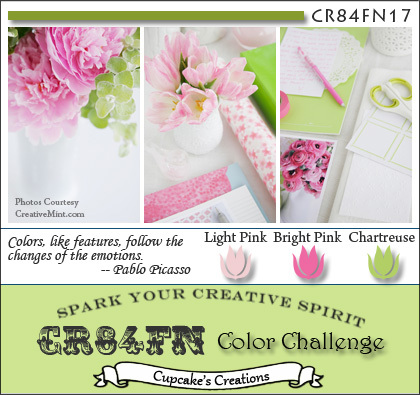 Visit Scrapbooking Supplies R Us and The Crop Spot to see the DT's beautiful takes on this month's sketch challenge. Hi everyone! I've got a card to share tonite based on Cardabilities Sketch 27. 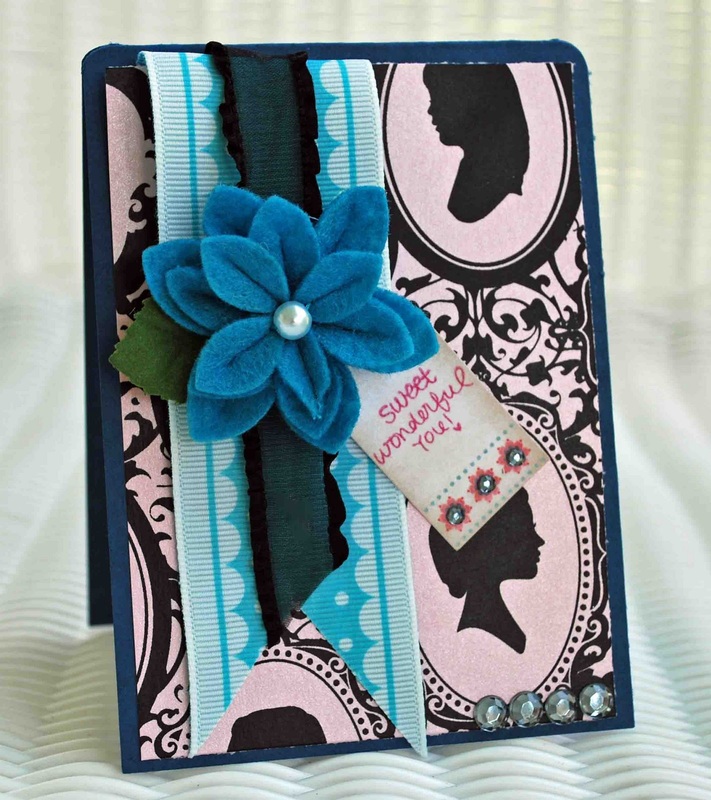 Paper Sundaes - "Keep It Simple"
DYSU Challenge - "Add a Bow"
It is so beautiful and Springy in Kentucky this week. I took a few pictures on the farm today and thought I'd share. This is Squab, my favorite hen. She's giving my turkey the "stink eye"! 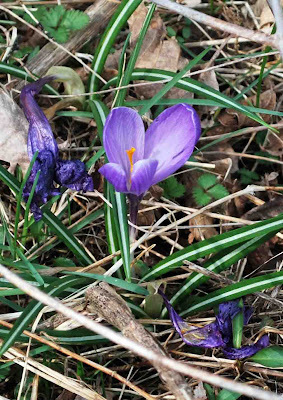 And look what I found, a pretty little purple flower! 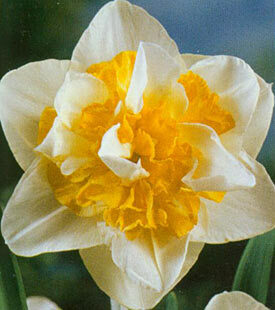 Spring is right around the corner folks and I couldn't be happier! Beautiful color! 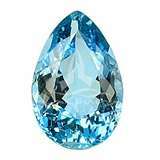 The definition is a color, a shade between green and blue and clear. Now for my card. 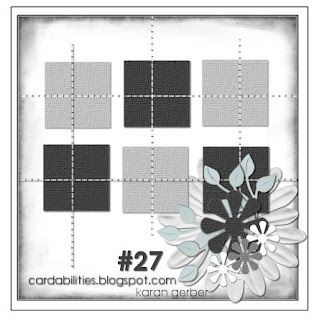 I created this card using goodies from March's Sampler Kit by Scrapbooking Supplies R Us. 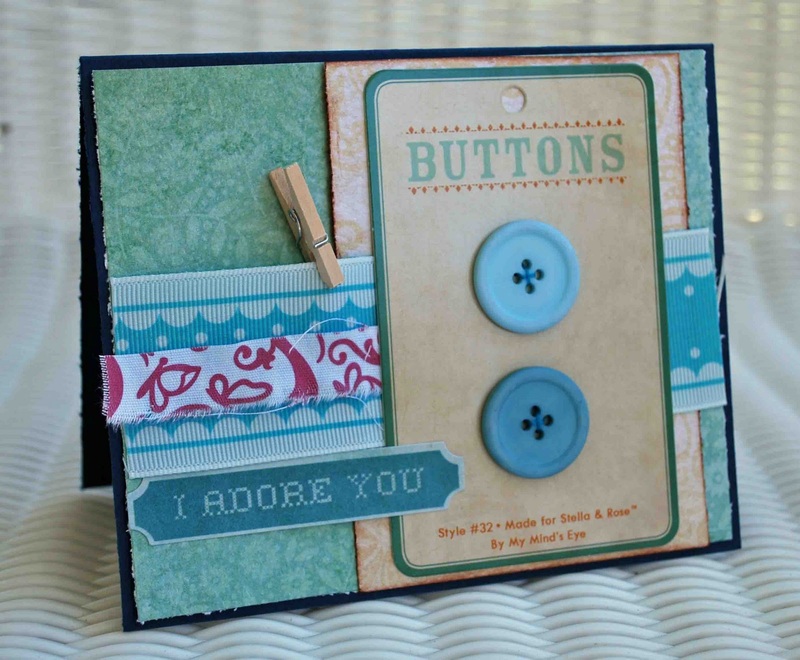 Button cards are a a must have at the moment in the crafting world. 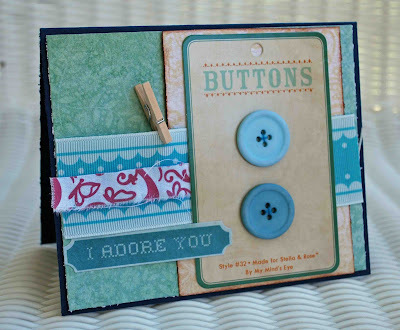 This button card is by My Mind's Eye. 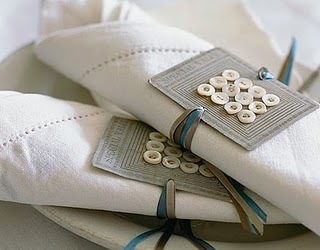 The buttons were so pretty, I used them on another project and added these Papertrey Ink buttons that match my colors. Visit "The Shoe" to see the Design Teams beautiful aqua creations. I also have a card for this week's Case Study Challenge 31. 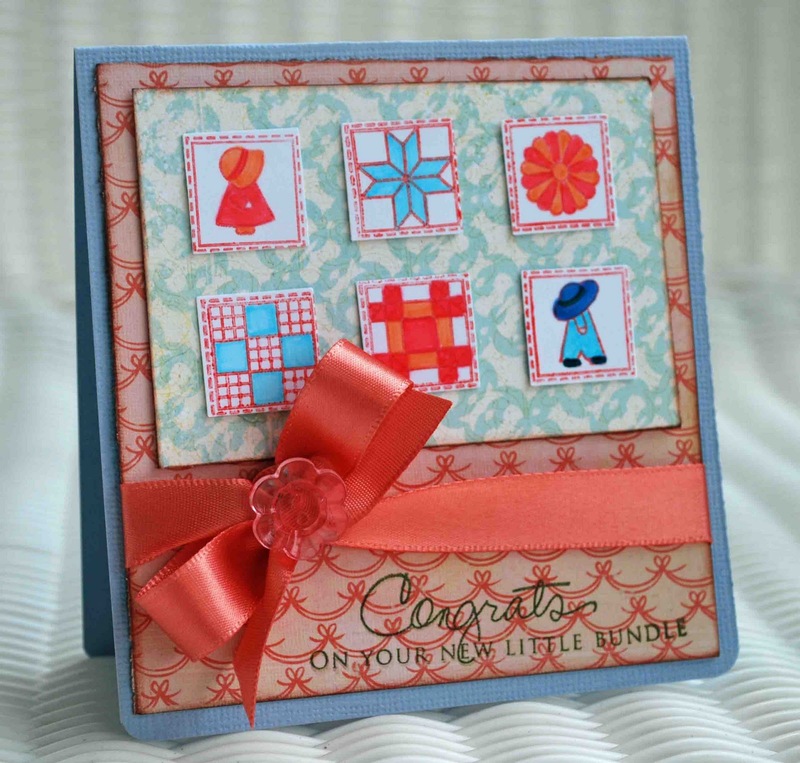 My papers and ribbon are from the March Sampler Kit. 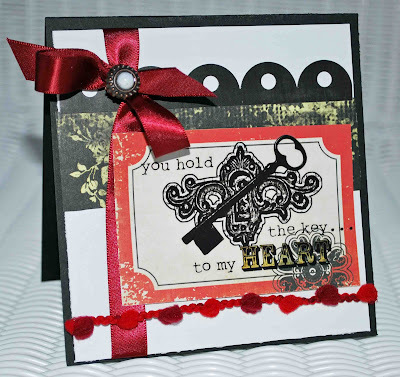 My stamped sentiment is Papertrey Ink and jewels are Creative Charms. 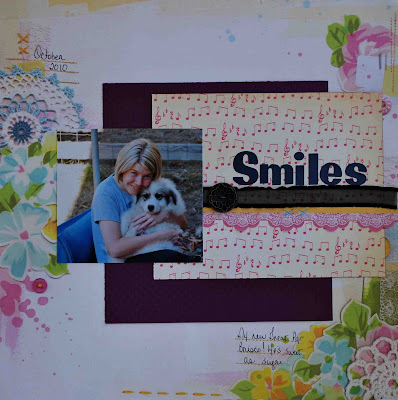 I think the Portrait Gallery paper from Hambley is my favorite yet! Love the cameo! Woot woot! That's my LO in this month's Creating Keepsakes Magazine (page 37 if you have a copy!). Oh my goodness, I've adored this magazine for YEARS and never dreamed I'd actually have a LO in it. It's bittersweet because Cornbread the duck is no longer with us, but at least he had his 15 minutes of fame! 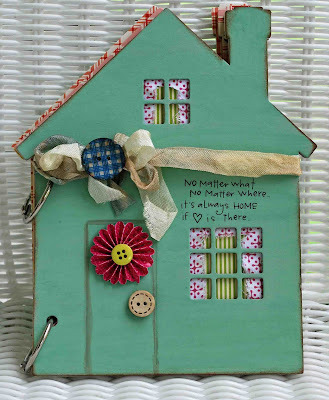 And if you'd like to win some goodies, visit Creative Charms this weekend! This week at "The Shoe" we are celebrating St. Patrick's Day. 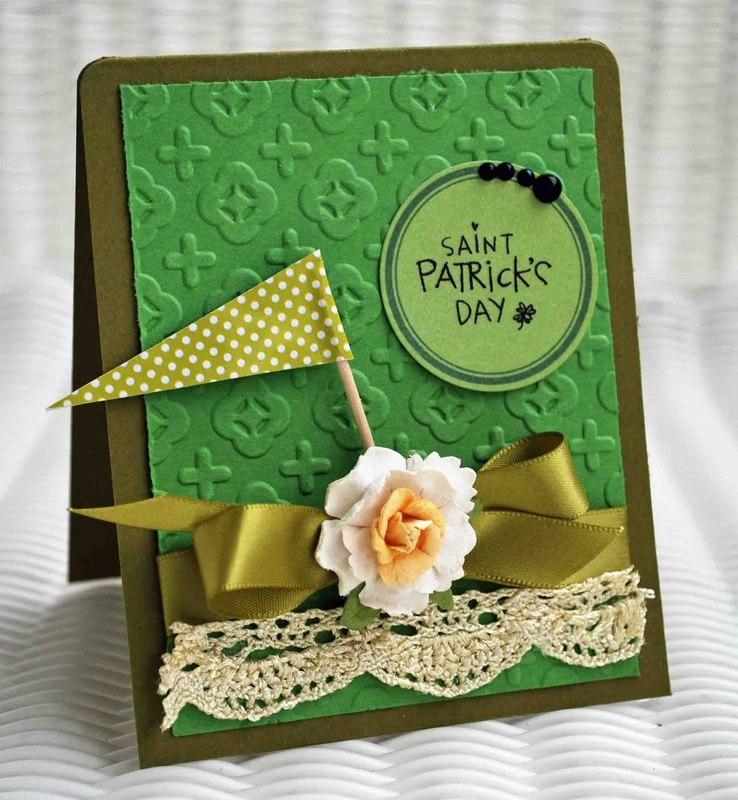 Our Fashionista Friday challenge is to make a St. Patrick's Day creation. I had never made a Patty's Day card, so this was a tough challenge for me! 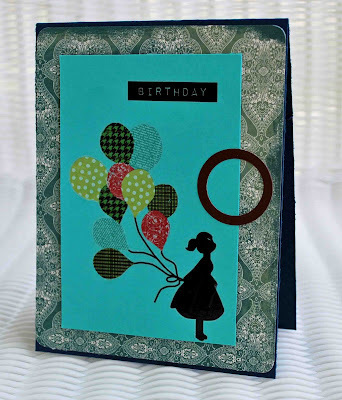 I used Papertrey Ink Cardstock and embossed using my Cuttlebug. I used PTI ribbon, Prima Flower, October Afternoon journaling spot, and jewels from Creative Charms. 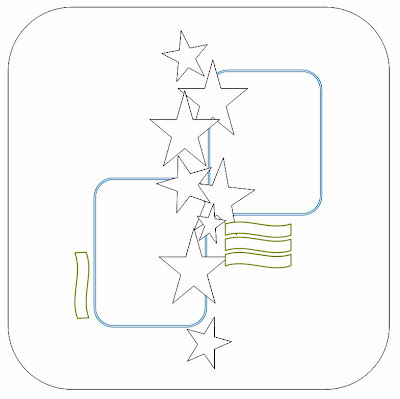 My sentiment is a Melissa Francas rub on and my little flag is Pebbles. 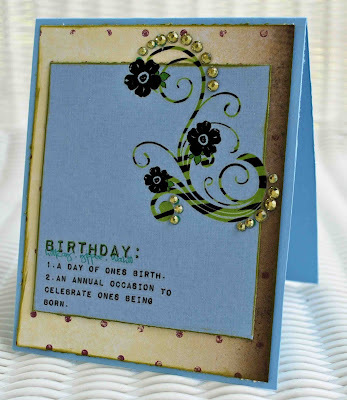 I added a touch of lace to make my card look vintage. 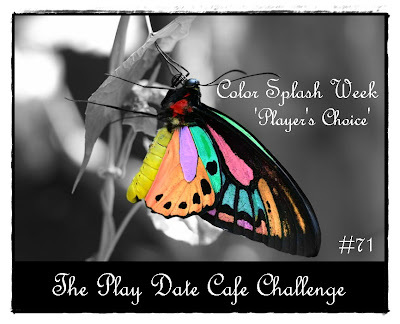 Visit If The Shoe Fits....Scrap It to play along with this week's challenge and see the DT's beautiful creations! Hi all! How's the weather in your neck of the woods? Well it's been warm one day, cold the next...guess that's typical for March. It snowed on Sunday, which was really a big downer. Plus I've been sick for a week, that's not doing much to improve my sour mood! But I do have very happy news to share tonite. 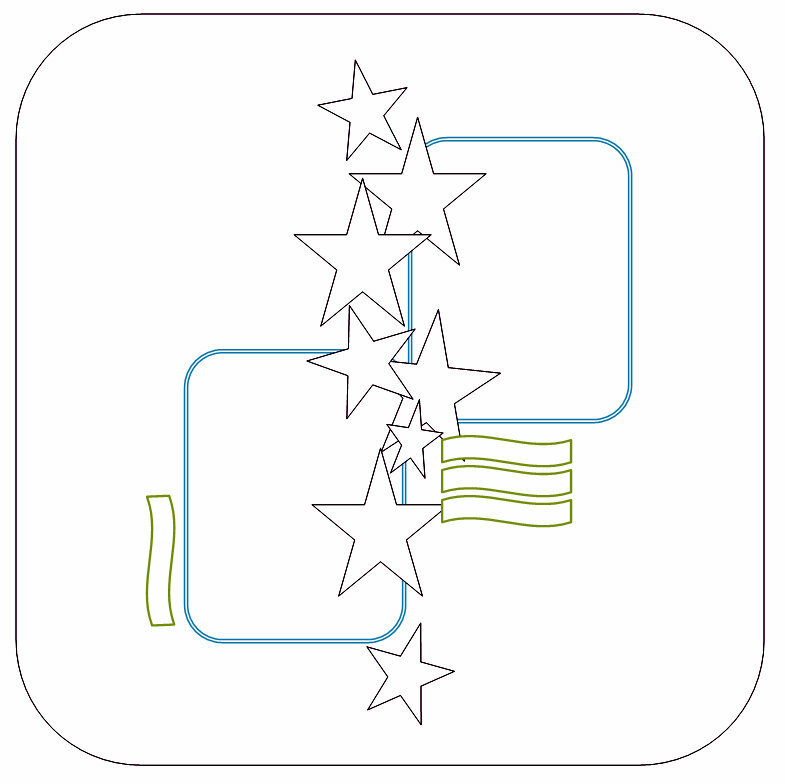 Guess what Design Team I'm joining??? Woot Woot! I'm a Cardabilities girl now!!! So very honored to be chosen for this DT loaded with talented ladies! If I wasn't so sick, I'd be jumping up and down : ) The funny part of it is, I still consider myself a scrapper first and card maker second. I think in the hustle and bustle of life, I've flipped that idea around though! 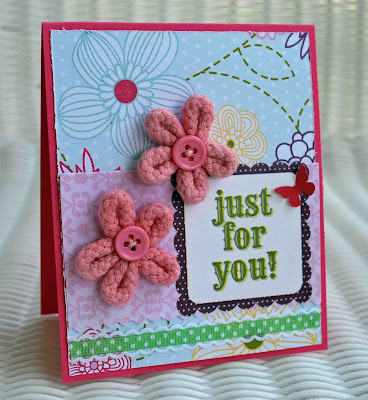 I adore making cards, something I avoided for a long time...so this proves if you're avoiding trying something new, go for it! Aren't they both beautiful and sooooo very affordable! And aren't those the cutest names you've ever heard??? 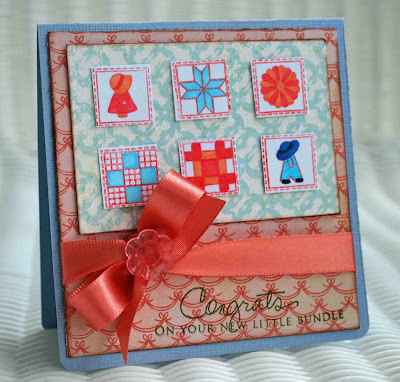 The February Sampler Kit is full of fabulous products! 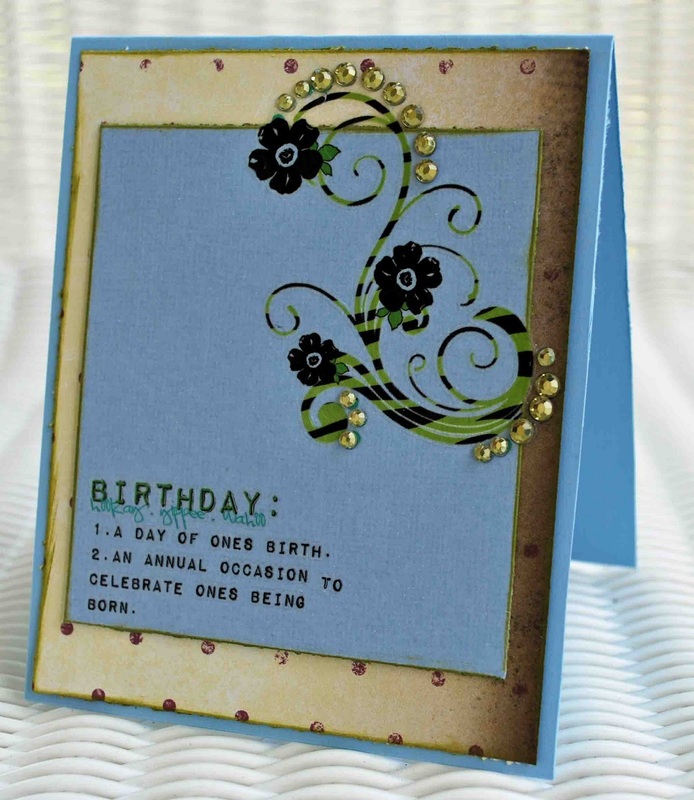 I love the Glitz birthday rub ons and I'm now an offical "Glitz" addict. 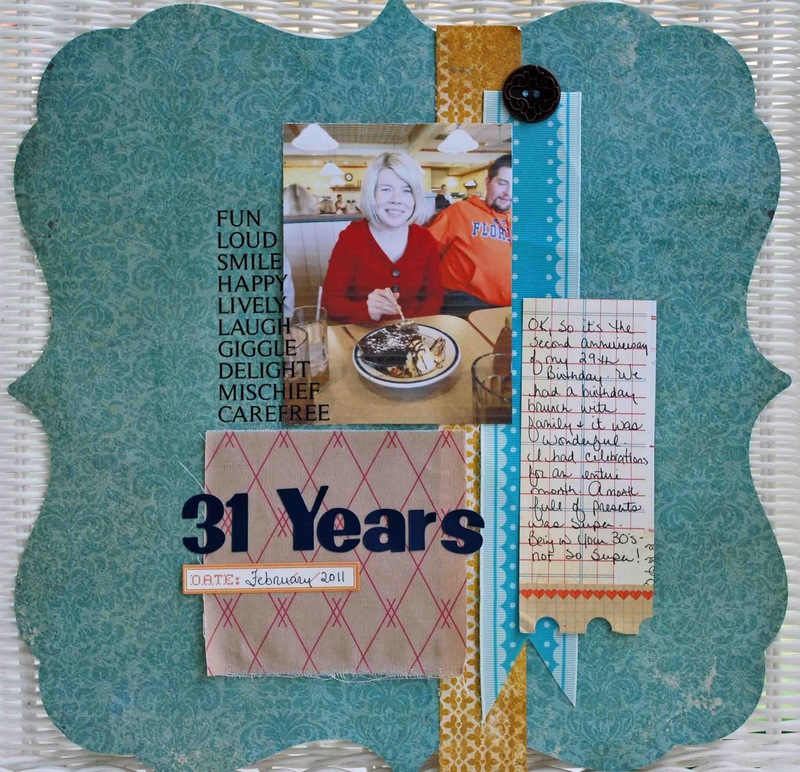 Visit Scrapbooking Supplies R Us to see the latest and greatest crafting supplies and visit The Sampler to see the amazing kits available. I used supplies from Papertrey Ink, Creative Charms, and Copics. I also Stickled my Daffidills to add some glitter and shine. 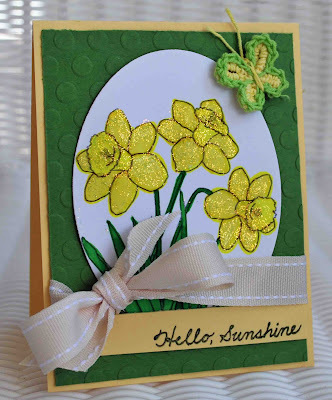 I ran my cardstock thru my Cuttlebug for a little embossing. 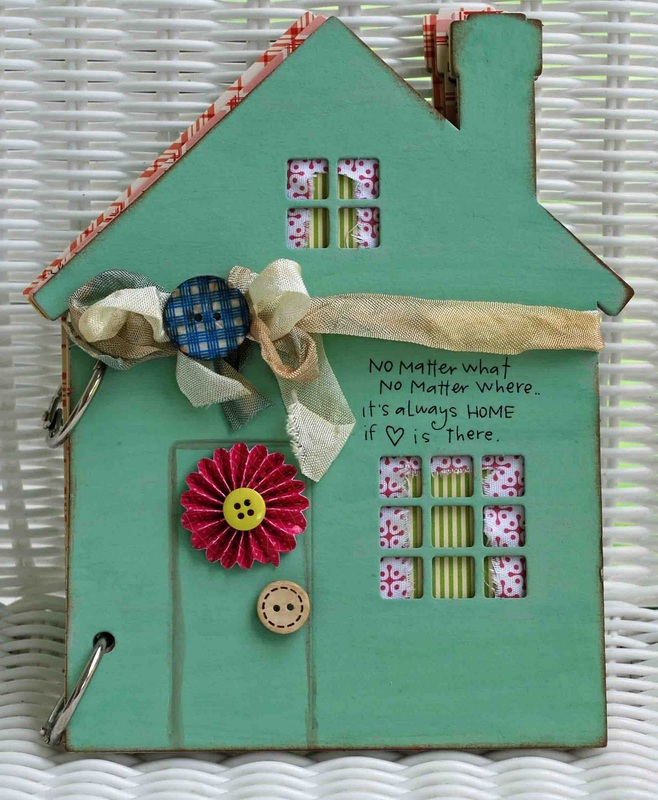 Visit If The Shoe Fits...Scrap It to see the Design Teams darling creations! 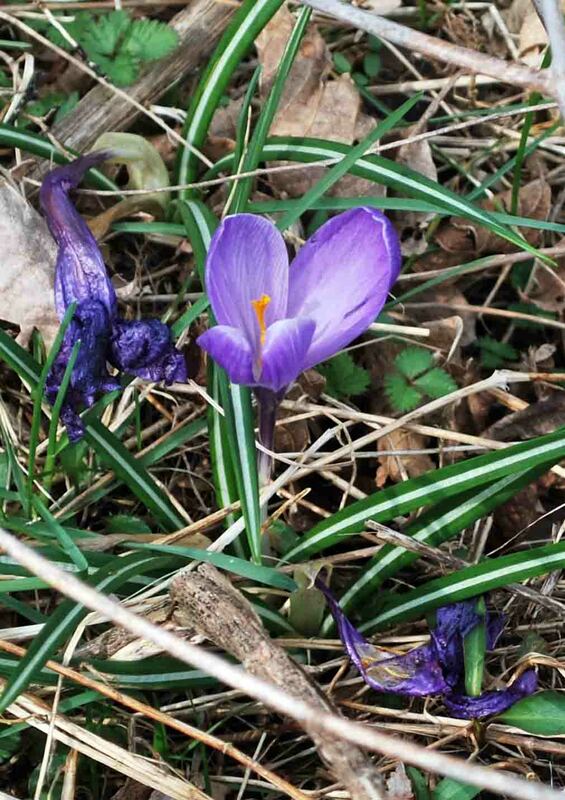 Ah, Spring is finally around the corner! Even though it may snow Sunday, the weather is still looking up in my area and I couldn't be happier. Behind on all my craftiness, my Grandpa has been VERY sick. So happy he's doing better now and out of the hospital. This card features goodies from Glitz, Papertrey Ink, and Creative Charms. 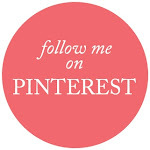 I also have posts going up tomorrow at Scrapbooking Supplies R Us and Creative Charms!